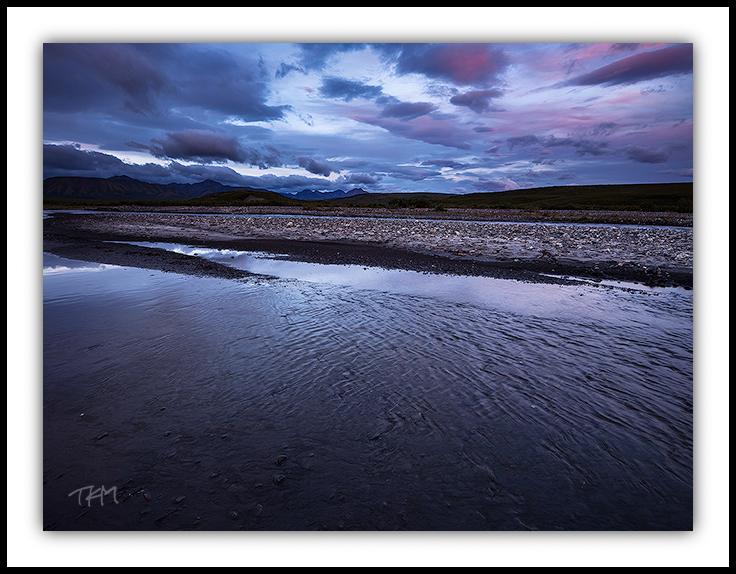 From my parking spot at the very end of the road that is accessible to private vehicles in Denali National Park, I began exploring along the edge of the Savage River. Looking west as the dawn tinted a few of the clouds with its warm light, I was struck by the utter wildness of the landscape stretched out before me. The far off peaks of the Alaska Range beckon, but the river flows swiftly, a real and tangible barrier to the first steps of the journey. Having driven hundreds of miles (the night before) in order to witness this pristine morning, I actually had no intention of traveling further into the park. My plans were to head East over the Denali Highway, but when I began processing this image, months after the trip, the wide wildness continued to speak to me. The photograph tells a story (at least to me) of longing and hesitation, beauty and uncertainty, and looking to the future. More than most people my age, I am surrounded by thoughts of the future. Teaching not just high school students, but primarily upperclassmen, the atmosphere around me is permeated by unanswered questions about college, finances, careers, relationships, and dreams. Sometimes I watch the final year of high school unfold for a student with a sincere longing to reclaim some of that feeling of having “your whole life ahead of you” – the feeling of standing at the edge of wilderness, but I am not blind to the real burden that uncertainty places on those very same students. I’ve known some incredibly bright and talented young people who very nearly buckled under the pressure leading up to graduation. But paralyzing fear of the future is not unique to high school seniors. Every one of us experiences uncertainty, from poignant fear to persistent doubt. We experience it because we are not in control of all things at all times, and more than that, we very rarely seem to be in control even of our own emotions, thoughts, and actions. If uncertainty is an inevitability in our lives, along the lines of death and taxes, what are we to do? What are some steps we can take so that our passion for life grows instead of shrinking when we contemplate the vast wildness of the unknown? The entire book has blessed me with a very palpable picture of a life where the best laid plans could never have resulted in producing even a small fraction of the joy that was waiting beyond the risk. At best, we can hope to orchestrate the satisfaction we can envision, but Katie Davis reminds us that the fullest future is actually outside our capacity to envision! The stories of other people’s lives may very well lead us directly into the next means for embracing the future’s wildness, which is the careful contemplation of our own lives. On the one hand, there are, no doubt, times in every person’s past that she or he could point to as an instance where playing it safe was the wise choice, where apprehension payed off. On the other hand, I’m convinced that those occurrences are seldom acquainted with our richest happiness. Instead, I have found that my moments of greatest joy have required trusting someone, having faith in the goodness of God, and finding courage to face the possibility of pain. My marriage is an ideal example. In the midst of what many would call an easy life, my commitment to continuing in permanent and consistent relationship with my wife, Breea, has sometimes been the source of anger, embarrassment, and hurt. Breea and I are both imperfect, and that means our relationship is far from perfect, but hundreds of the best moments of my life would vanish if I could somehow go back and undo my promise to be her husband and life-long companion. Similarly, anyone who has welcomed a child into their family should be able to point to that time when fear of risk was completely erased by the experience of the reward. A God who is both sovereign and good is the only God who can bring “hope” out of an unknowable future. Knowing Him allows you to put one foot in front of the other – to walk into the wilderness with more joyful excitement than apprehension. When we learn from the experience of others, consider the patterns from our past, and rest in the reality of God; the wildest future is the future we will long for! It is nice to go over old pictures and see new visions.